If you have ever experienced writer’s block, or are in desperate need of an urban getaway to catch a few moments of tranquility surrounded by an aromatic and sophisticated ambiance, read further to find out about five havens that will satisfy every bookworm’s sweetest imagination. Prepare for your next journey by venturing into the world of this travel-themed independent bookstore. Littered with travel guides and maps of your favorite destinations, this bookstore is perfect for those overwhelmed with wanderlust. Tourists visiting Taipei should also drop by – if not for the atmosphere, then to write a postcard to friends and family in far away places, which the bookstore will gladly mail out on the visitors’ behalf. Do not be skeptical of this dimly-lit and seemingly small antique market, populated by a hodgepodge of independent stores. Inside, you will find all sorts of trinkets and memorabilia from Taiwan’s rich cultural history, from secondhand furniture, signs, dated toys, candy, cans, to old film posters, plates and many more bits and bobs that may make you nostalgic for a bygone era. Inside an antique Japanese-styled building, Qing-tian Tea House is a quiet oasis located next to Caves Gallery, one of the oldest and most venerable art galleries on the island. The building’s beautiful design also incorporates elements of Taiwanese architecture. Enjoy some tea while admiring the gallery’s impressive collection of artwork by famous Taiwanese artists. Stroll through this scenic structure, nestled in a community of houses built during the Japanese colonial era, and get a feel for the life and times of one of Taiwan’s most influential intellectuals. Author, educator and philosopher Yin Hai-guang is often hailed as the forerunner of Taiwanese liberalism. Yin Hai-guang’s house is now owned by the National Taiwan University and used as a memorial space and exhibition featuring many of Yin’s works. Hidden in an alley, Dushing Bookstore was founded in memory of Yin Hai-guang. 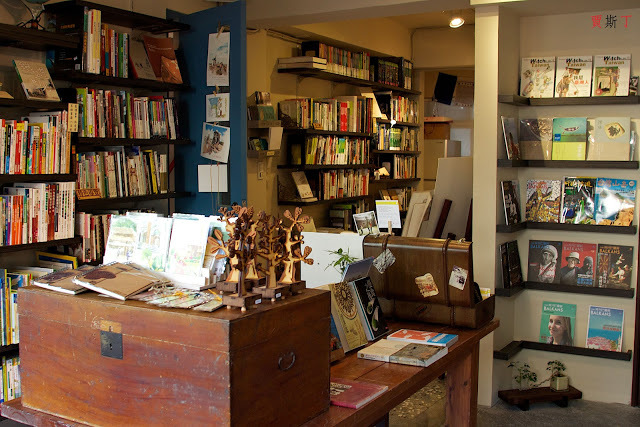 Besides the dusty smell of antique books and manuscripts, the bookstore features old photos of the late thinker, as well as many of his authentic works. Just ask the shop assistant and you will be granted entry into the exhibition room, filled with works and objects from Yin’s life.